Here are some other options you could consider Bloodsoaked Champion, Goblin Bushwhacker, Pelt Collector, Rhys the Redeemed, Chief of the Edge, Chief of the Scale, Decorated Champion, Den Protector, Duskwatch Recruiter Flip, Hidden Dragonslayer, Rushblade Commander, Thorn Lieutenant, Voltaic Brawler, and Blood-Chin Fanatic. Also a quick note about the mana base. Having so few basics in the deck could be quite dangerous. Certainly there is always the possibility of not hitting the correct colors, but having more basics lets you use more flexible ramp and as is, a Blood Moon or Ruination would be crushing. Chief of the Scale seems pretty underwhelming. 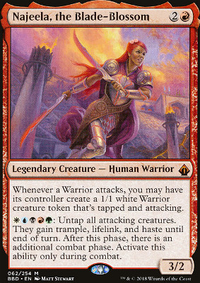 I might run Eladamri's Call, in its place, helps you get what you need and also have plenty of warriors. I do like your idea of Iroas, maybe cut the other captain for him. 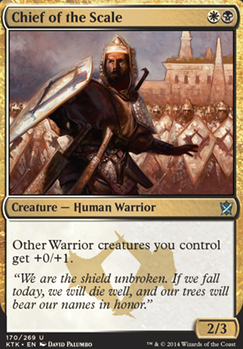 I'm not a huge fan of Pathbreaker Ibex I really think Overwhelming Stampede is better any time you don't have haste. The fact that it is a non warrior with no protection for itself are two huge downsides. I don't like Whispersilk Cloak but do like Vanquisher's Banner. I also always run Swan Song now. It's ability to save you from destruction and board wipes, and even other counters, in a pinch is really helpful. Chief of the Edge & Chief of the Scale should fit right in with her. Odric, Lunarch Marshal though not a warrior will open up other creatures in your deck to take advantage of your warrior boost. 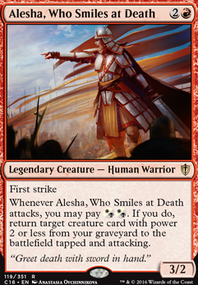 Yeah Chief of the Scale has been sideboard, but I've been heavily considering maining him for Mardu Shadowspear. I think I will go ahead and do that. Thanks m8! 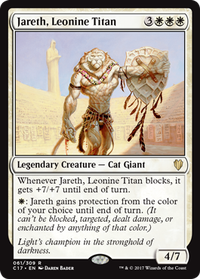 I would recommend Chief of the Scale, because there are a lot of board wipes going around in modern like Pyroclasm, Anger of the Gods, and Whipflare. This Chief might give your warriors a little extra umph. Possibly a Chief of the Scale, what is your budget? Tormod's Crypt or Leyline of the Void, Leyline of Sanctity, and Kalitas, Traitor of Ghet. Most of those cards are expensive, and I understand if your budget doesn't allow. I run a similar deck that I haven't bought anything for and it runs lot's of exile like Silkwrap and Caught in the Brights. It also runs a few angel's and a Vizkopa Guildmage. I like the deck! what about Chief of the Scale he is a great warrior 2 for a 2/3 and a little buff for the team is nice.